African golden wolf (Canis anthus). A study was released today in the journal Current Biology that will radically change how we classify the genus Canis. Using genome-wide analysis, researchers led by Klaus-Peter Koepfl found that African golden jackals, including those that have recently been classified as African wolves (Canis lupus lupaster), are all genetically distinct from Eurasian golden jackals. But they are also distinct enough from wolves to be considered their own species, which has been posited as Canis anthus, the African golden wolf. Previous studies had suggested that certain African golden jackals were actually a primitive form of wolf, but these studies were based upon mitochondrial DNA alone. This study compared a relatively large sample of nuclear DNA from several related Canis species, and it found that golden jackals of Eurasia and those of Africa were not even closely related to each other. African golden jackals split from the coyote/wolf lineage some 1.3 million years ago, while Eurasian golden jackals split off about 1.8 million years ago. This pretty much ends the question of Canis lupus lupaster, but it does create an interesting question. In the Guardian‘s article on the study, Koepfli thinks that the reason these two species, the golden jackal of Eurasia and the African golden wolf, were considered the same species is because of parallel evolution. I actually disagree with this assessment. If you go back and start looking at fossils of old wolf-like canids, they all start to look very jackal-like. Indeed, as I’ve pointed out here many times, the black-backed and side-striped jackals are quite genetically divergent from the other wolf-like canids. They are more genetically distinct from the rest of Canis than the African wild dog and the dhole are, and both the dhole and African wild dog each has its own genus. (My remedy for this paraphyly in Canis is to put the dhole and African wild dog in Canis, but it also could be solved by creating a genus for the side-striped and black-backed jackals, which is what I think the move will be). The reason why these two jackals look like both forms of golden jackal and the coyote is that all of these animals represent primitive forms of Canis. The ancestor of the large northern wolves that everyone knows was a coyote- or jackal-like canid, as was the ancestor of the African wild dog and the dhole. “Primitive,” as I am using it here, means that an animal retains traits of the ancestor that sister taxa have lost. So in this perspective, the various jackal and coyote species still look very much like the common ancestor of all Canis. This type of dog is quite versatile, for it is big enough to defend itself from many other predators but it is small enough to subsist on rodents and carrion. 1. Found that the eastern wolf and red wolf are recent hybrids between wolves and coyotes and are not actually an ancient wolf species. 3. Found that there are two species in what we used to call the golden jackal: the African golden wolf and the Eurasian golden jackal, which we might just drop to “Eurasian jackal” for common nomenclature. So we’ve lost two species in the dog family and gained two. And I would argue that we should recognize the tanuki of Japan as a disctinct species from the rest of the raccoon dog species, and I would also argue that the island fox of the Channel Islands is a subspecies of the mainland gray fox. It is far less genetically distinct from the gray fox than the domestic dog is from the wolf. We also need to do similar studies on South Indian and Himalayan wolves, which have distinct mtDNA lineage. I would really like to know what the genome-wide analysis would reveal on those two wolves. I would also like to see an examination of black-backed and side-striped jackal populations, because I suspect there is some interbreeding where the ranges of the two species overlap. Jackals have never been really interesting to scientists studying the dog family, but it is likely that the first canids that wandered the camps of our hunter-gatherer ancestors were black-backed jackals. It was their barks that alerted us to approaching leopards, and they got to lick some of our pots and eat some offal. But they never made the same leap that wolves did. It is for this reason alone that I think one should be skeptical of hypotheses on dog origin that rely upon scavenging and the inheritances flight distances alone as the determining factor. No one has seen a spotted jackal of any species or one with floppy ears, but they are the world champions of scavenging. Jackals just lack the charisma of the larger dog species, but I do know that if I ever get to Africa, the first species I want to see is the black-backed jackal. Then we’ll worry about the big cats. Yep. I’m that much of a canid enthusiast! 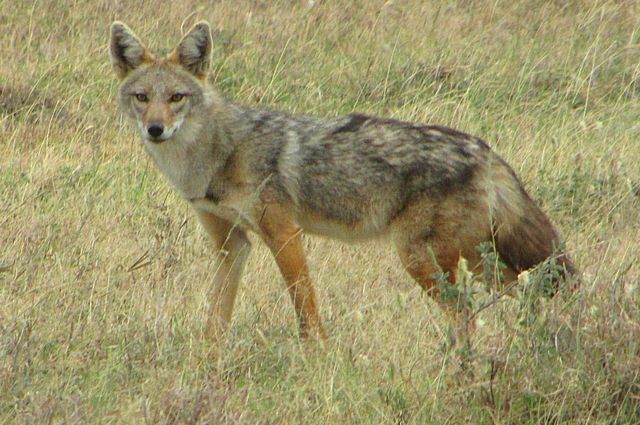 Egyptian jackal or African wolf with golden jackal and wolf-like features. From “Roosevelt in Africa” (1910). One the strange ironies about dogs is that we have set up a system in which populations are maintained without regular influxes of new blood. However, at no point in the evolutionary history was this ever the case. Some dog fanciers maintain breeds as if they were distinct species, and in some breeds, one can find lore that they are derived from sort of wild canid that has nothing to do with wolves or the rest of dogdom. Chihuahuas are supposedly domestic variants of the fennec fox. The Japanese chin was said to be distinct species that belonged to its own genus. But no matter how you slice it, domestic dogs are all one species, and what is even more important, the more we have found out about the genome and that of their closest relatives, the harder it becomes to think of them as a distinct species from the wolf. And if that weren’t such a revelation, it really gets more bizarre when we have no learned that wolves, golden jackals, and coyotes are not the cut-and-dry species we assumed them to be. In Eastern Canada and the Northeastern US and Midwestern US, we have discovered that wolves and coyotes have hybridized a whole lot more than we realized. We have also found evidence that golden jackals and wolves have hybridized in Bulgaria. Both coyotes and golden jackals can cross with wolves or domestic dogs and produce fertile offspring. To make things more complicated, it turns out that wolves and golden jackals have continued to exchange genes since the two species separated. A recent genome-wide study of modern dogs, wolves, and golden jackals revealed that Eurasian wolves and golden jackals continued to mate with each other after their initial separation. The authors found substantial gene flow between golden jackals and Israeli wolves, as well as the ancestral population to all wolves and domestic dogs. Most North Americans are aware of the taxonomic controversies involving coyote and wolf hybrid populations, including the red wolf and the proposed “Eastern wolf” species, but it turns out that this problem also exists in the Old World. There is now a debate as to whether certain sub-Saharan and North African golden jackals are golden jackals or wolves. A few years ago, there were several studies that suggested that the mitochondrial DNA of certain African golden jackals were actually those of a primitive wolf lineage. 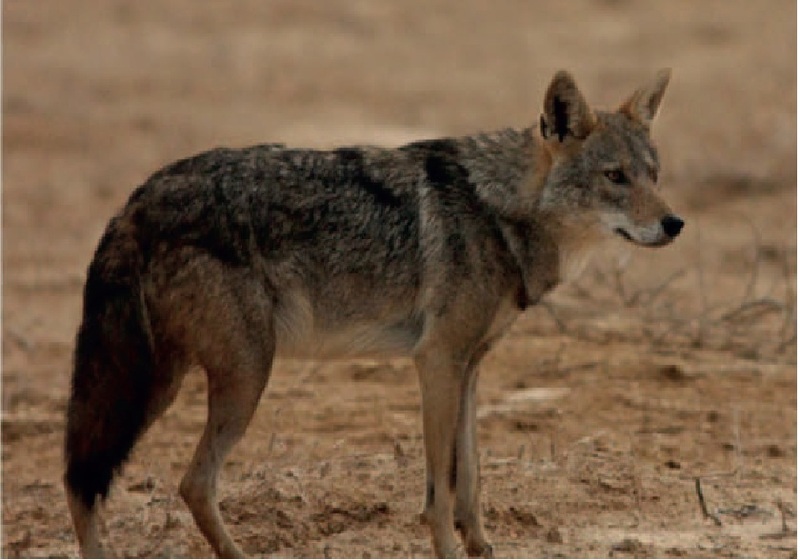 There is still some debate as to whether these animals are wolves or jackals, and some of the proposed wolves have been found to hybridize with golden jackals in Senegal. In utter ignorance of the natural history of wild Canis, domestic dog fanciers have spent the past century to century and half splitting up gene pools under the delusion that this somehow preserves them. Never mind that for most of their suggested 2 or 3 million years on the planet, wild wolves have continued to exchange genes with their closest relatives. When species hybridize, it was always thought that this would be a negative, but in truth, hybridization can be source of genetic rescue. In the case of Eastern coyotes, crossing with wolves can introduce new genes for more powerful jaws and larger size, which make them better predators of deer. It can also introduce new MHC haplotypes, which can provide the animal with enhanced immunity to disease. One way of looking at golden jackals and coyotes is they are actually themselves primitive wolves. This might sound a bit heretical, but if you were to go back into time and find the ancestor of all wolves, golden jackals, and coyotes, it would look more less like a golden jackal or coyote. I would argue that these animals represent a sort of generalized template from which larger, more specialized forms can evolve. One of the problems in sorting out wolf, coyote, and jackal lineages from the fossil record is that at various times through their history on the planet, different lineages have evolved larger wolf-like sizes or have produced coyote or jackal-like forms to fit the niche in question. A recent comparison of golden jackals, African golden jackals that might be wolves (Canis lupus lupaster or Canis lupaster), black-backed jackals, modern wolves, and the extinct Canis etruscus and Canis arnensis revealed that those the proposed African wolves had skull morphologies that were closer to known golden jackals and black-backed jackals. If these lupaster canids are actually wolves and not jackals, then we would have never been able to guess their identity upon morphology alone. So while the dog fancy has been splitting hairs and arbitrarily dividing up gene pools, science has revealed that the wild dogs haven’t been doing the same. Canis is not a closed registry. Science has found all of these wonderful things out, but the dog fancy remains stuck in another era. Maybe someday it will move beyond the closed registry system and instead of offering up the bromide of “breed preservation,” it will adopt a system of “breed management,” which strives to maintain genetic diversity within a breed and allows regular influxes of outside blood. That is what nature has allowed with the wild Canis. That is the actual story of the animals of this genus. It is not one of one lineage remaining pure for millions or even thousands of years. It is about significant hybridization. And Canis is not the only genus with this hybridization issue. Ducks in the genus Anas hybridize quite a bit, and it is well-known that many species of whales and dolphins hybridize with their close kin as well. All of these animals are fairly mobile organisms, and their mobility is likely why they retain so much interfertility. They simply cannot be reproductively isolated from their closest relatives long enough for them to lose chemical interfertility. It is not something that should be thought of as an evil. Instead, it’s actually a major strength. It is one our own species utilized when we exchanged genes with the Neanderthals and Denisovan people, and if there were another human species alive today, we would likely be able to cross with it. But because we are so alone in this world, it is difficult for us to understand the concept of a species complex. We are the only humans left. But dogs and wolves are not the last of their kind. The gene flow between wild and domestic and among the these three species of Canis is something we have difficulty imagining. But it is the story of dogkind. I call these the Farley Mowat wolves. Farley Mowat claimed in his famous book, Never Cry Wolf, that wolves in the Canadian arctic lived on mostly mice and lemmings. Of course, those wolves do eat small prey, but they do take caribou and moose. The Ethiopian wolf, which is not the same species as those in Canada, does live mostly on rodents. They live in the Semien and Bale Mountains of Ethiopia. They live in large family groups, but unlike the Holarctic wolf, they don’t band together to hunt much larger prey. Instead, they forage alone in alpine meadows, stalking rodents in this fashion. When I was a kid, these animals were called Semien jackals. But then a mitochondrial DNA study was released that suggested that Semien jackals were actually recent derivatives of the Holarctic wolf that became isolated in Africa. 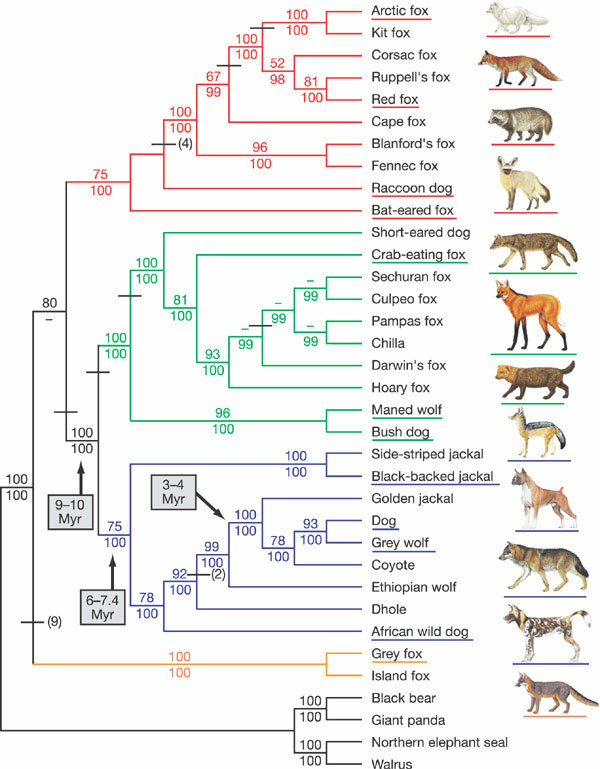 However, the phylogenetic tree that was drawn from sequencing the dog genome revealed that these animals were actually more distantly related to wolves and dogs than golden jackals and coyotes are. We could technically call them Semien jackals and be correct. But the name “Ethiopian wolf” has stuck. Plus, the Ethiopian wolf is quite endangered, and the notion that this animal was somehow a unique wolf of Africa increased its prestige in the public eye. Of course, it turns out that there is an actual wolf subspecies in Africa. But it’s likely not endangered, and it is difficult distinguish this animal from the golden jackal. For years, these animals were classified with golden jackals, but they should be recognized as wolves. So it’s all messed up. Ethiopian wolves are wolves that live in Africa, but they aren’t African wolves. Just like so many other things, our language has become confusing. This looks like it’s going to be a great wildlife documentary. Check out Nyala Productions’s website for more info. One little quibble. There are actually two wolves in Ethiopia. There is the Ethiopian wolf (Canis simensis), which is the creature that will be the focus of this documentary, and there is also the newly discovered African wolf subspecies (Canis lupus lupaster). This African wolf subspecies was once regarded as a suspecies of golden jackal, but through sampling some supposed golden jackals in the Ethiopian Highlands, it was determined that they actually represented an ancient mitochondrial matriline within Canis lupus. This African wolf should also not be confused with Xenocyon lycanonoides, which is an extinct canid that is sometimes called “the African wolf.” It is actually the ancestor of the African wild dog, but its range was quite extensive in Africa and Eurasia until around 800,000 years ago. It continued to live on in Africa, where it evolved into its smaller current form. Canis lupus arabs in the Negev Desert in southern Israel. 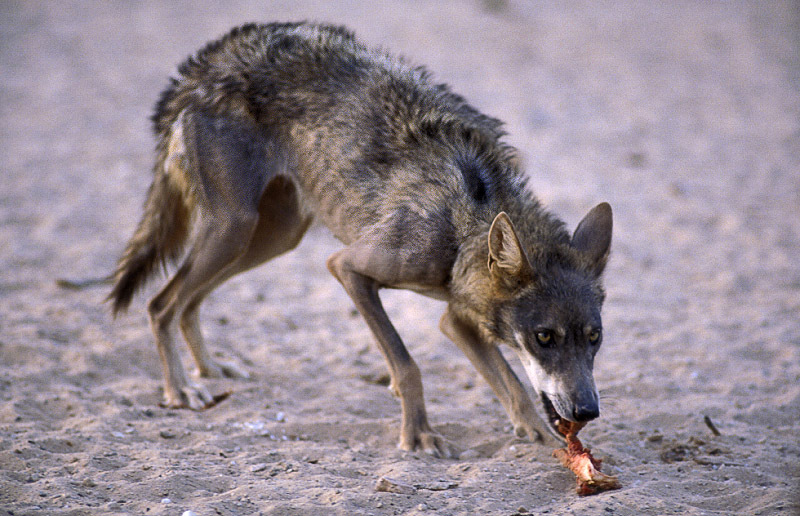 Some of these Israeli Arabian wolves are weigh only 25 pounds. Until the cryptic African wolf subspecies was discovered last winter, it was the smallest extant subspecies. The African wolves were considered a subspecies of golden jackal. 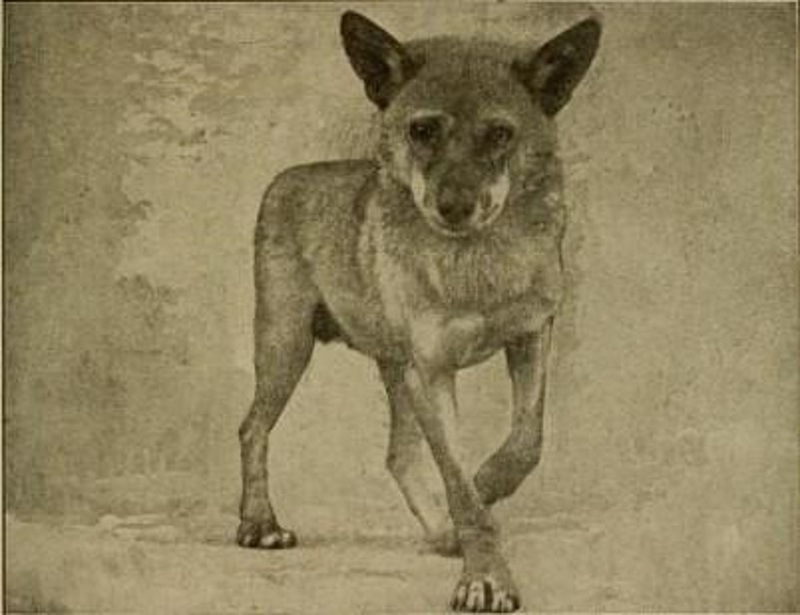 In addition to these very smaller extant subspecies, there was also a diminutive subspecies of Canis lupus in Japan. It was most common in Honshu, but it was also found on Shikoku and Kyushu. It became extinct because of a rabies epidemic that caused these little wolves to attack people.